The last time that New Jersey voters elected a Republican to the United States Senate, Richard Nixon topped the party ticket and the winning Senate candidate was Clifford Case, a proudly liberal Republican who opposed the war in Vietnam, embraced civil rights and environmental protection and frequently ran with the backing of the AFL-CIO. Since 1972, thirteen Republicans have been nominated in thirteen elections for Senate seats—four of which had no incumbent on the November ballot—and thirteen Republicans have been defeated. In recognition of that reality, a typically cynical Republican governor might have taken advantage of the state’s confusing and contradictory statutes to appoint a Republican successor to Democratic Senator Frank Lautenberg, who died Monday. An appointed senator could have served through the end of 2014. With Senate deliberations so shaped by arcane rules, partisan divisions and ideological positioning, an appointed rather than elected senator would have provided a boost to the Senate Republican Caucus at a potentially definitional stage in Barack Obama’s second term. But Chris Christie is not a typically cynical Republican governor. 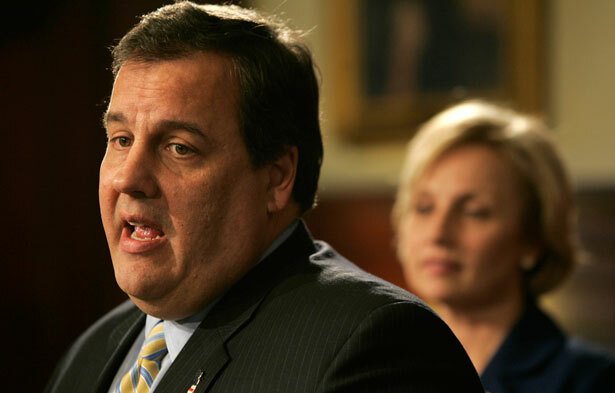 Chris Christie is a supremely cynical Republican governor. Christie has chosen to schedule the special election to fill Lautenberg’s seat on October 16—twenty days before the regularly scheduled state election. And he’s still going to send an unelected Republican-selected senator to Washington during a critical stage in congressional deliberations. The governor wants New Jersey, and America, to think that his scheduling of the special election is a nobly nonpartisan gesture. There is, after all, a very real prospect that come October another Democrat—perhaps Newark Mayor Cory Booker, perhaps Congressman Frank Pallone, perhaps someone else—will win another New Jersey Senate election. “I’ve decided on a special election because I firmly believe we must allow the citizens of this state to have their say,” he piously announced on Tuesday. But don’t confuse Christie with a small “d” democrat. He’s twisting the process to his own advantage. The governor could have scheduled the special election on a timeline that paralleled New Jersey’s November 5 election—in which polls peg Christie as a favorite to be re-elected. That would have saved taxpayers at least $24 million dollars and a lot of confusion. Instead, notes New Jersey Working Families Alliance executive director Bill Holland, Christie has chosen to hold two general elections in a one-month period—an approach that is all but certain to confuse the electorate and suppress turnout. Christie’s move—which has angered Senate Republicans in Washington, as well as Democrats in New Jersey—was entirely self-serving. By gaming the ill-defined process, the governor has protected himself from the prospect that Democratic voters—mobilized by the Senate contest—might stick around to vote for his determined, yet underfunded, Democratic challenger, state Senator Barbara Buono. Were Cory Booker, the most prominent African-American political figure in the state and a popular figure with young voters, on the ballot as the Democratic nominee for the Senate, the boost in turnout might well change the dynamics up and down the ballot. Christie wasn’t willing to take that risk. And tailoring the election schedule to his advantage is just one of Christie’s offenses against democracy. The governor—despite his declaration that “decisions that need to be made in Washington are too great to be determined by an appointee”—still plans to appoint an interim senator to fill the seat until after the October special election. That appointee is likely to serve as a reliable member of the Senate Republican Caucus when the chamber addresses key issues ranging from the debt ceiling to trade policy to the future of Social Security and Medicare to the implementation of the Affordable Care Act. Indeed, if Christie chooses to play to the conservative base that will play an outsized role in selecting the 2016 Republican presidential nominee, his pick could make a dysfunctional Senate that much more dysfunctional. But the worst thing about an interim senator is not the partisanship. It is the anti-democratic nature of the selection. For 120 of the most important days in the legislative calendar—perhaps more—New Jersey will be “represented” not by a senator selected by the voters but by a senator selected by one man, Chris Christie. The Constitution absolutely bars anyone from sitting in the US House of Representatives by appointment. No seat can be filled except by a regular election or, when a vacancy occurs, by a special election. When the Constitution was amended 100 years ago this spring to establish a directly elected Senate—ending the former practice of choosing senators in the backroom legislative deals of the Gilded Age—the intention of progressive reformers was that Senate seats would be filled in the same manner as House seats. Unfortunately, the Gilded Age hangers on identified a loophole that allowed governors to make appointments to finish the terms of senators who die or resign. Some states, such as Wisconsin, moved quickly to establish a clear system of special elections to fill vacancies. But most allowed governors to take advantage of the appointment power. And they have abused it ever since. Dozens of senators have taken office via appointment rather than election over the past century, including ten currently sitting senators. Three senators have been appointed since the 2012 election, and Christie’s “interim” pick will push the number to four. The appointment process is disorganized and inconsistent. Some governors appoint placeholders, others position allies—or even themselves—to run in upcoming elections. Some governors have to follow rules (in a few states they are required to appoint a member of the party of the departed senator), while others can make up the rules as they go along. Five years ago, Senator Russ Feingold, the Democrat who then chaired the Constitution subcommittee of the Senate Judiciary Committee, joined with then–House Judiciary Committee chairman John Conyers to propose a constitutional amendment to require that all senators be elected. Under the Feingold-Conyers proposal, vacancies in the US Senate would be filled in the same manner as vacancies in the US House—by the voters in quickly called and organized special elections. With Feingold out of the Senate, and with Conyers now in the minority in the House, there is less discussion of this reform—although some of us have raised the issue consistently since 2008, when Democratic and Republican seats have come open. The inconvenient truth is that both parties take advantage of the loophole. In February, after former Massachusetts Senator John Kerry quit to become President Obama’s secretary of state, Massachusetts Governor Deval Patrick selected a longtime aide and ally, William “Mo” Cowan, as Kerry’s interim successor. Cowan has served ably, and he is a Democrat filling a Democratic seat until a new senator is elected June 25. Two other appointees, South Carolina Republican Tim Scott and Hawaii Democrat Brian Schatz, will serve until after the 2014 election as unelected senators. That’s the problem that Feingold and Conyers have highlighted: as appointed senators, they have the exact same ability to advance or obstruct legislation and presidential nominations as senators who fought and won elections. And in the case of Scott and Schatz, they will do so for the better part of two years. Appointed senators are throwbacks to a less democratic time, when the economic and political elites disregarded and disrespected the will of the people. The same goes for the gaming of election schedules to benefit governors who are seeking re-election. Chris Christie is practicing the politics of the Gilded Age, when powerful executives dismissed electoral niceties and did as they chose. John Nichols is the author (with Robert W. McChesney) of the upcoming book Dollarocracy: How the Money and Media Election Complex Is Destroying America, which outlines a reform agenda that calls for establishing a guaranteed right to vote, getting corporate money out of politics and electing—rather than appointing—all senators.